With that in mind, I’m getting ready for all things Fall! 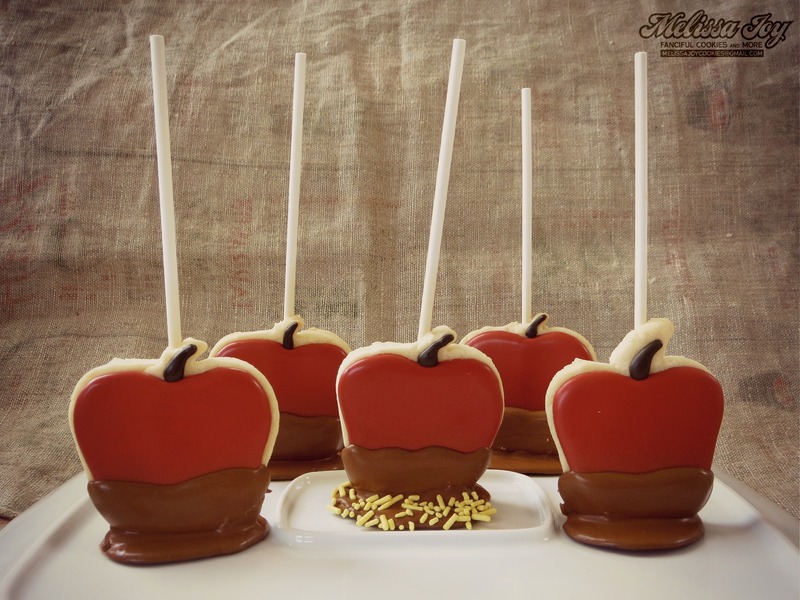 Leaf piles, pumpkins, corn mazes, apple picking, apple cider, apple pies, applesauce and caramel apples. 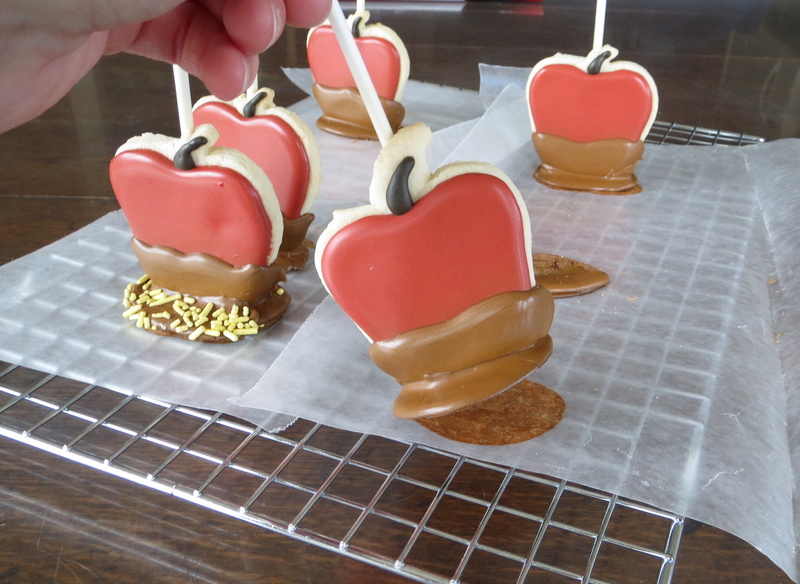 Or…caramel apple cookies! These were made using my sugar cookie recipe, lollipop sticks, and royal icing, and here’s how I accomplished it. 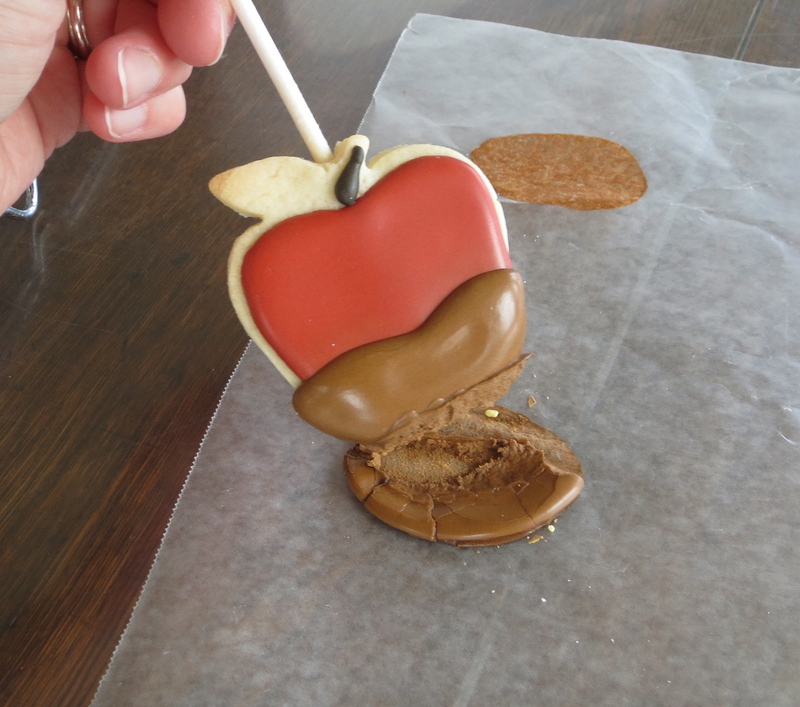 Once the cookies were constructed and cooled, I frosted the apple part and let that dry for several hours, then frosted the “caramel”, just on the bottom half. I achieved the caramel color by mixing Americolor Ivory, Brown and Gold together. I was happily surprised at how much the frosting actually looked like caramel. Well, I figured maybe because I had the wax paper on a cookie sheet, it wasn’t getting enough air circulation. Plus it was humid, and humidity is your worst enemy when you are a cookie decorator. 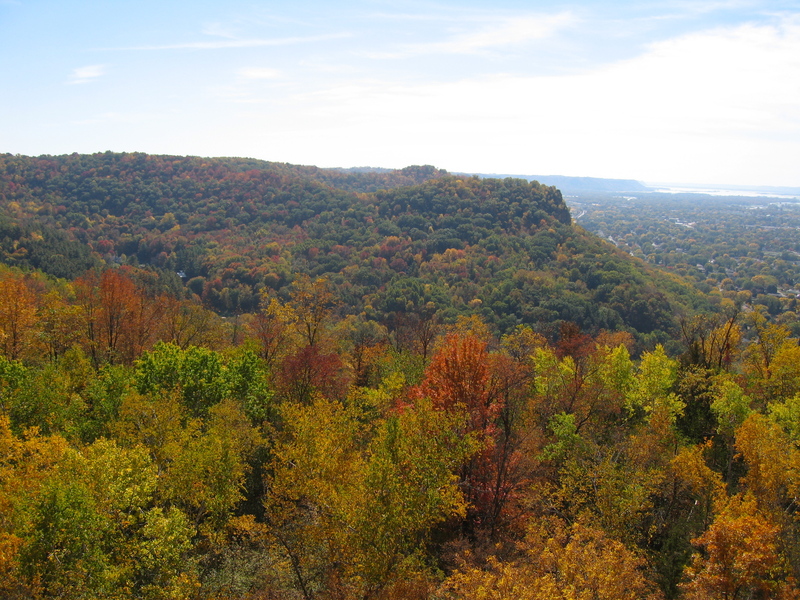 This is another reason I am ready for Autumn’s crisp air! Success! I peeled them off and they stood up on their own! Rather sturdy too. I’m so proud. I am curious to know how it would be to use the same method using actual softened caramel on the bottoms. Would I get the same results once it hardened? Would they stand? I may have to give it a shot sometime. Or if you do, let me know how it turns out. Honestly, I would most likely just eat the caramel straight from the wrappers before it would even get close to a cookie. 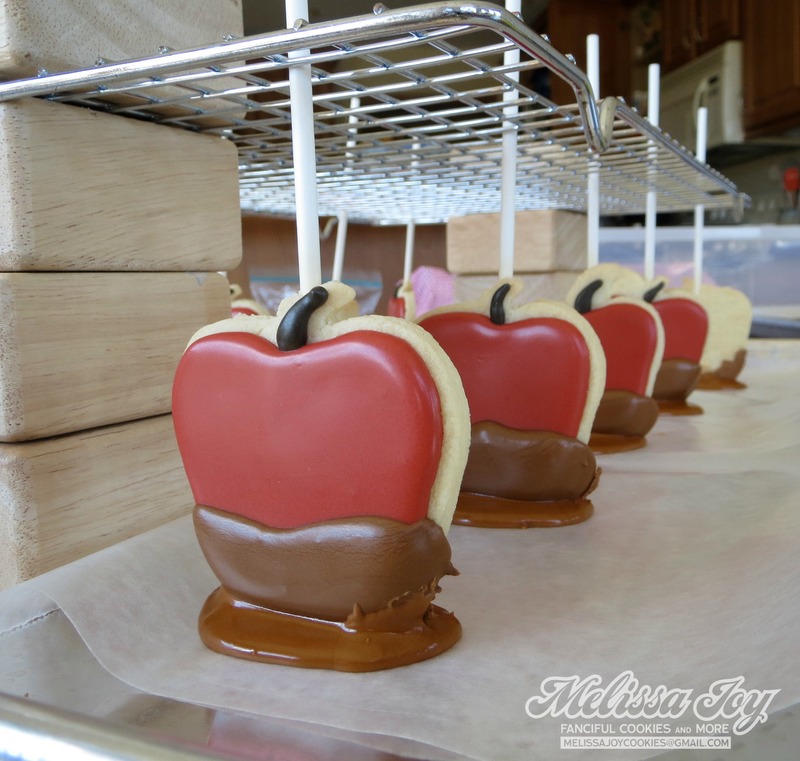 This entry was posted in Cookie Tutorials, Fall Cookies, For Fun Cookies, Halloween Cookies, Holiday Cookies and tagged apple cookies, autumn cookies, caramel apple cookies, caramel apples, cookie lollipops, fall in wisconsin, Wisconsin autumn. Bookmark the permalink. I love these! You sure come up with the best ideas! I bow before your brilliance. Freaking fantastic designs and ideas. Carry on, please! Me+Caramel=Same as You! They’d all be eaten, but now I want to try a caramel dipped cookie so bad! 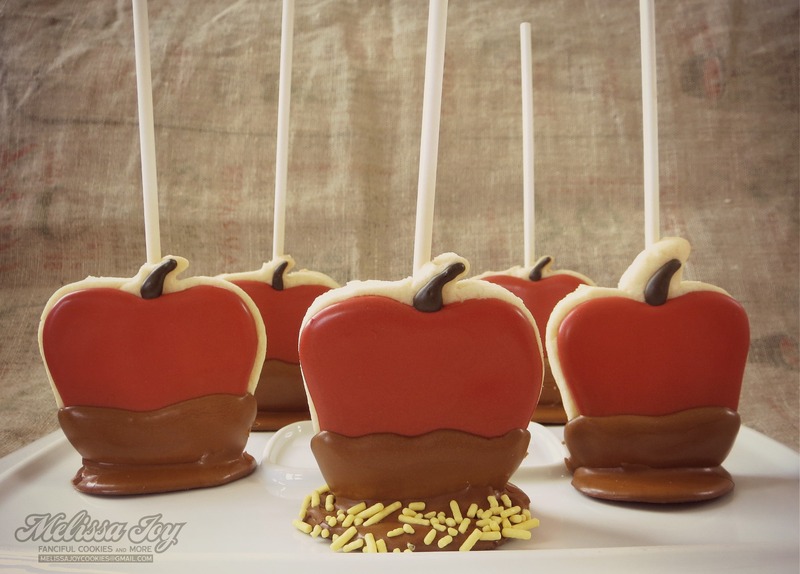 What if they were apple flavored somehow- bits of dried apple and cinnamon and cider syrup? And then dipped in caramel and toasted nuts. I’m gonna try it! And then I’ll send you some if there are any left! DO IT! Then you MUST send me some, since I inspired you, right? Right?! Mmmmm, caramel…. You are a cookie making genius (and more patient than I will ever be)! Such a fun idea! I find it very hard to believe you don’t have the patience, Miss Melissa! 🙂 Hope your school year is going well! 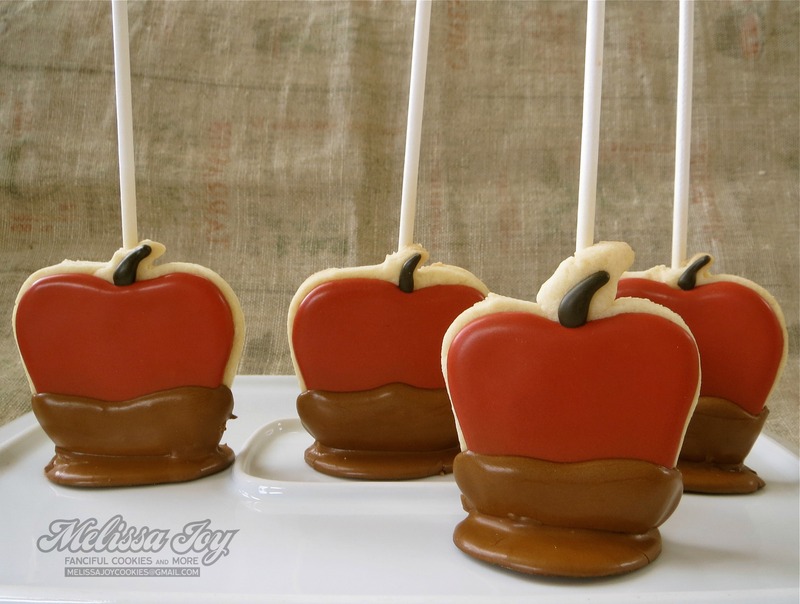 The “apple cookies” are just adorable and I bet just as good to eat, unless you want to keep them as a decoration. Cute idea, Missy, glad they turned out so well. Will I ever get use to your new ideas? No, you are such a designer/decorator. my thoughts exactly about the caramel, but these are just great..thanks for sharing. It has been a cake-but summer, can’t wait to start rolling dough!